HomeBlogBigger batteries: More Ah needed? 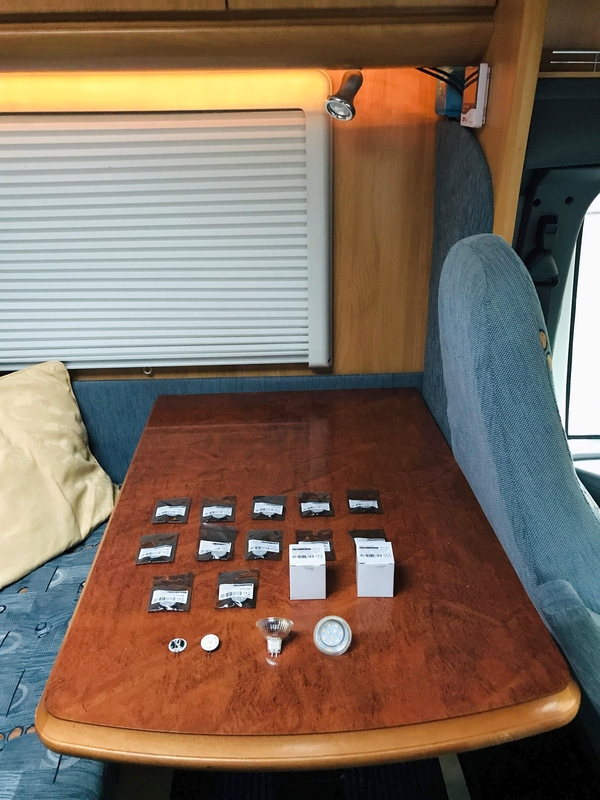 This blog is primarily aimed at motorhome, RV, campervan, caravan, commercial vans, boat and yacht owners – concerning the issue of more battery capacity needed, with different ways to achieve that. When running out of amps many assume their leisure batteries have failed, yet often this is not the case. It’s more how, where, when and what the batteries are used for. Things like cold temperatures, high loads and deep discharges affect battery capacity (Ah) and life. And certainly these days we often place greater demands on leisure batteries than the original system design may have intended. This presents a dilemma. 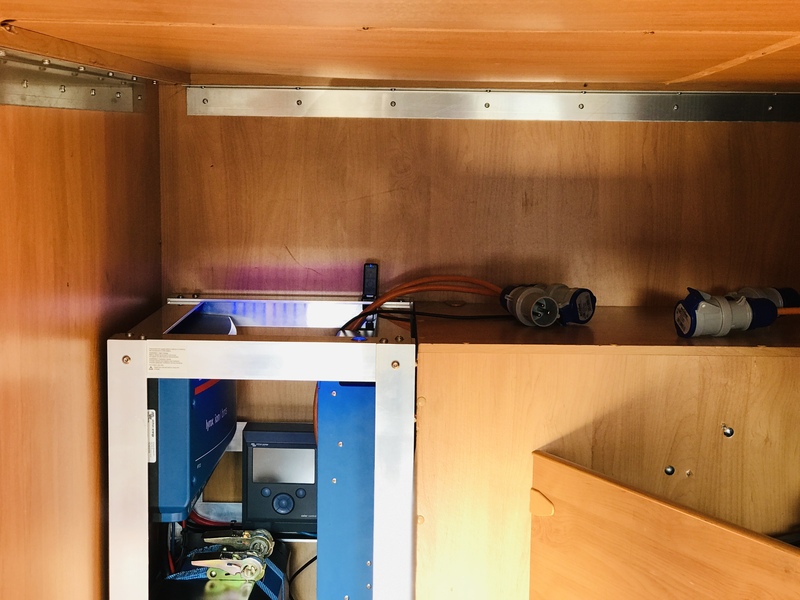 A typical small yacht, that was built some years ago, might have a 90Ah leisure battery and a 80Ah starter battery on a split charging system. The battery boxes, cabling, charger and alternator will all have been sized accordingly. But these days you are running more equipment, often at higher loads and need therefore more battery capacity – so you don’t have to start the diesel engine to inefficiently charge with the alternator, when away from shore power. Maybe you start off by adding a small solar panel, but even that is not enough. Now you are faced with redesigning the system to get more capacity. Costly in both time and effort. The same goes for motorhomes. For instance, my recently acquired 12 year old Hobby T600 motorhome (shown in the headline image) has 1 x Sonneschein gel leisure battery 78Ah (C20), 65Ah (C5) and a Duracell 74Ah starter battery. That gel leisure might be fine for folk with small 12V needs that spend 90% of their time on hookup, use gas for cooking, heating and 230V for the fridge – and rarely go off-grid. But as I soon discovered, switching on a number of 10W lights and running the gas heating fan overnight – it quickly depleted the leisure battery whilst away from shore power. No surprise there you might say, but once again you find yourself pondering more power and energy from the leisure battery or batteries. In the meantime updating to all LED lighting at 1/10th of the power consumption has helped, plus changing to a Victron MPPT from the old PWM one for my 100Wp solar panel means it performs more efficiently and improves solar harvest. The MPPT in the top right of the photo below is networked using a Smart Battery Sense, as the ambient temperature of the MPPT compared to the leisure battery temperature can be as much as 10°C difference. Doing this ensures temperature and voltage compensated charging; a factor that also needs to be taken into account for cold weather charging. 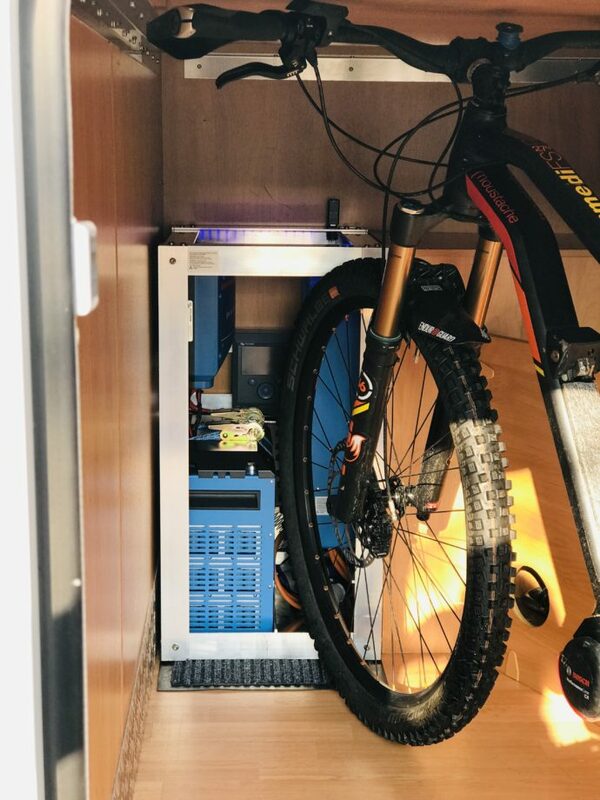 The above mods though didn’t fully solve the problem – as I wanted to charge my electric bicycle off-grid, plus my friends’ bikes and make ‘electric’ toast, use an electric toasted sandwich maker, boil a small 600W kettle, plus run my laptop and other device chargers from AC power. That meant an inverter. Not something everyone requires, but having AC and DC electricity can be very useful. The solution – just get bigger batteries? 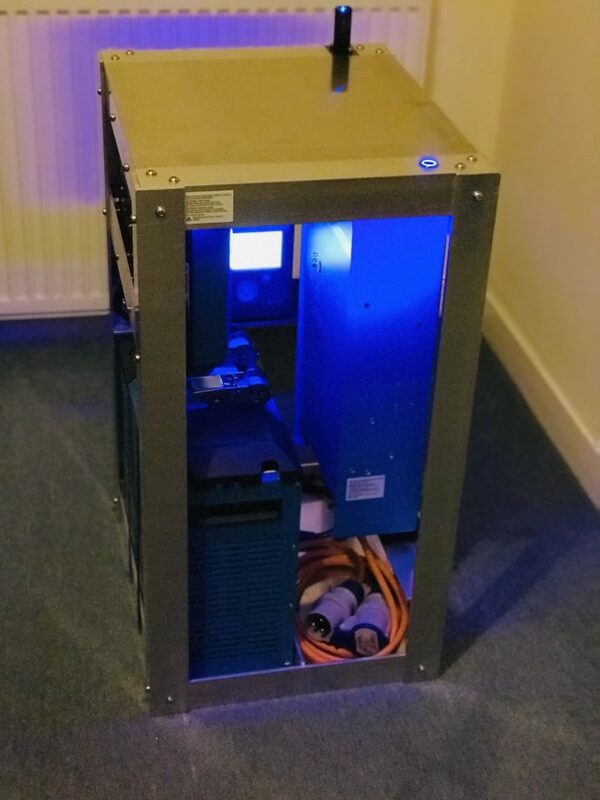 A larger Ah battery solution might sound obvious but once you start looking into it you discover you need extra space, the current battery box or boxes are too small, weight might be an issue, the cables are too thin to take higher current, the charger is no longer big enough, plus where to locate an inverter if needed. If that’s not a project you can do yourself there will be an expensive hourly rate to get a technician to upgrade your system. There has to be a simpler way. Fortunately most modern boats and vehicles, to get more kWh and Ah, generally have larger and often paralleled batteries. Personally I prefer a large monobloc battery (say 220Ah) or smaller ones in series to give the equivalent Wh of energy, as that is considered safer than parallel. Need more batteries for a new build, then series the largest monoblocs you can get and run at say 24V or 48V with DC to DC step-down to 12V. That assumes you have a suitable alternator of course. Regardless, it’s easy to see that getting more energy and power with an upgrade is not as easy or as inexpensive as it might first appear, when compared to designing a new build. Insight tip: Energy vs Power if those terms and their differences are not familiar to you. 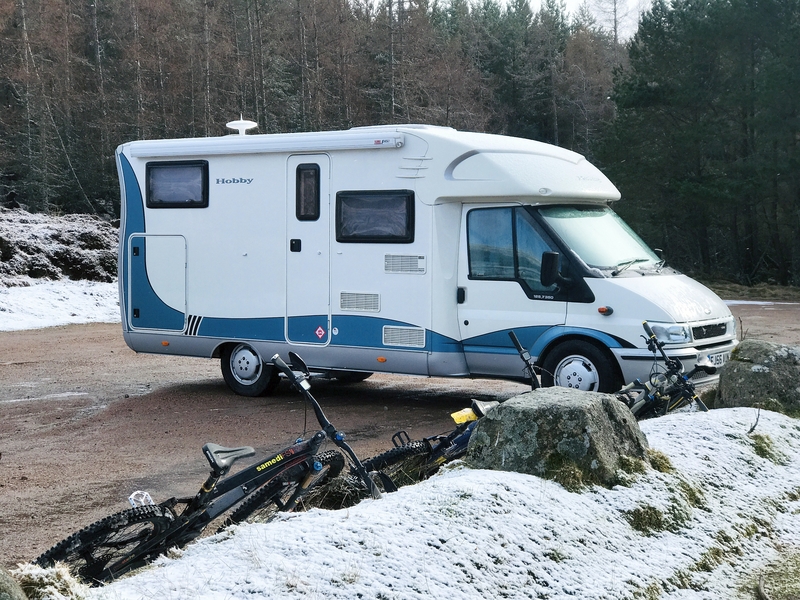 Compared to my older vehicle my friend’s nearly new motorhome has both more energy and power available, with 3 x 95Ah (C20), 85Ah (C5) Varta AGM batteries giving a total of 285Ah @12V at the 20 hour C rate, where C refers to the capacity and the 20 or 5 is the number of hours to deplete the battery to 10.8V (flat). Faster discharges shrink the Ah – as you can see by that 5 hour Ah rating which is related to the load. Note those Ah capacities for those C rates are when a battery is used on its own, not when paralleled as running in parallel with more Ah improves any reduction in Ah due to higher than standard 0.05C loads. These ratings referred to are all at a temperature of 25°C, which is the standard rating temperature. Below that temperature, battery Ah decreases further as it does with age. So, what starts out as 285Ah (of which 50% is generally accepted to be the economic discharge usage) is now 285/2 x a higher load than the standard rating of C20 (or 0.05 x Ah) of say 0.1C (28.5A discharge) at 25°C (an inverter type load), which then shrinks the Ah by a factor of around 0.84 as shown below – 285Ah reduced to 240Ah. Temperatures of lower than 25°C and age will shrink that Ah even further. I have assumed a Peukert exponent of 1.25 for this 285Ah lead acid AGM battery bank. The Peukert Calculator used in the screenshot above is a spreadsheet in Microsoft Excel format that allows you to enter the battery capacity and Peukert’s exponent. It then selects various discharge rates, calculates run times (note that the times are in decimal hours i.e. 1.5 hours is 1 1/2 hours = 1 hr 30 minutes), Peukert corrected amps and total amp hours available at the different discharge rates. It also incorporates a graph of discharge current against available amp hours. The extent of the effect may surprise you. The calculator, written by Chris Gibson, is the copyright of SmartGauge Electronics and is available here. Now let’s put in an ageing factor of 0.8 (so you still get what you need even when the batteries get older) and suddenly the available Ah is 285 x 0.5 x 0.84 x 0.8 = 95.76Ah or 12V x 95.76Ah giving 1.15kWh of useable energy compared to a stored C20 energy of 3.42kWh 25°C. No wonder folk think their batteries need replacing or they need more Ah! The above applies to lead-acid battery technology, lithium is far more forgiving with a Peukert of around 1.05. You can read about LiFePO4 vs AGM technology in a recent blog I did concerning Victron Energy’s new SuperPack batteries. Contemplating getting more useable Wh for my motorhome I started looking at upgrading my standard system, but the leisure battery is under the passenger seat with restricted space, the wires run under the floor and inbetween bulkheads, plus I needed a bigger charger, not to mention an inverter to charge my electric mountain bike. Maybe the alternator would need to be upgraded too. Anyhow hopefully you get my point – it was simply not realistic to modify the standard system either in terms of cost or effort, plus the leisure battery happened to be brand new. My solution was to create a separate, standalone, portable ‘Powerpack’ – similar to a powerbank for mobile phones. It was something I could put together easily in the comfort of my workshop (living room in fact). 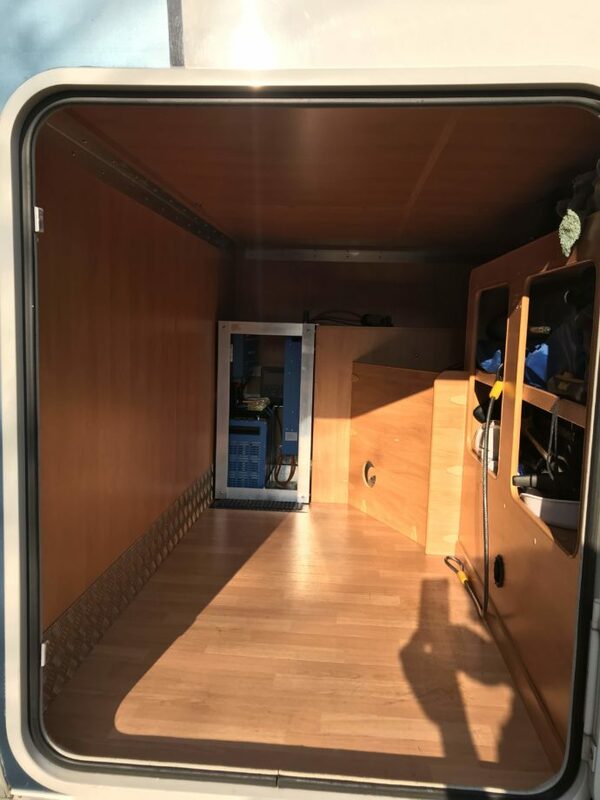 Admittedly I went somewhat over the top – but that is as much to illustrate what can be achieved and how space and weight criteria can force a choice. Ideally I prefer Lithium-iron-phosphate (LiFePO4 or LFP) to our Lithium-Ion HE Battery and Lynx Ion BMS, as LFPs have a higher cycle life and the HE BMS is quite sizeable taking up extra space. However in this particular case due to the actual dimensions of the space available and weight considerations I had to use the HE NMC type. Fortunately my inverter loads are low too, so the HE type could accommodate them, whereas on my boat LFPs are better due to that chemistry’s higher continuous discharge rates. 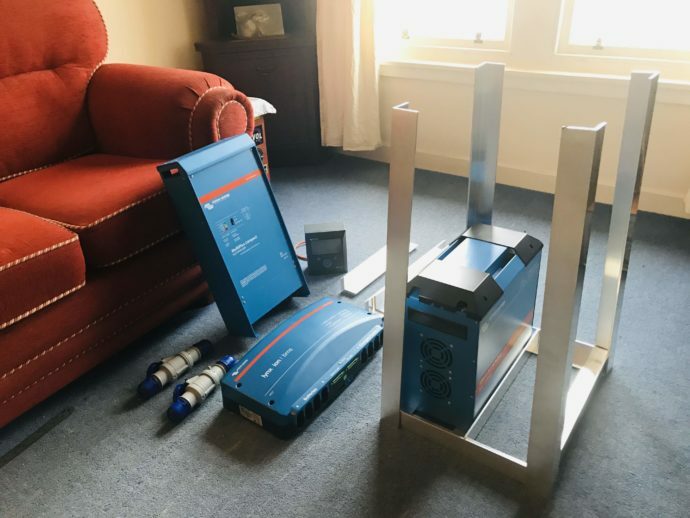 In fact were weight and size not an issue then AGM’s would have been okay too, as of course would the all in one design of the Lithium SuperPack range – having no need of an external BMS taking up extra space. You’ll see what I mean in the table later in this blog. Your requirements might be more modest too in terms of battery type, power and size – so besides my own Powerpack build I’ll include other versions in a later blog, which will show how to size an inverter for charging electric bicycles off-grid as an example. For now I’ll leave you with some before and after photos of my solution, which simply goes inline with the hook-up shore power prior to the RCD/Consumer unit in the van. Unplug two male/female 16A commando type plugs/sockets and the original system is back to normal and you have a Powerpack for use elsewhere. 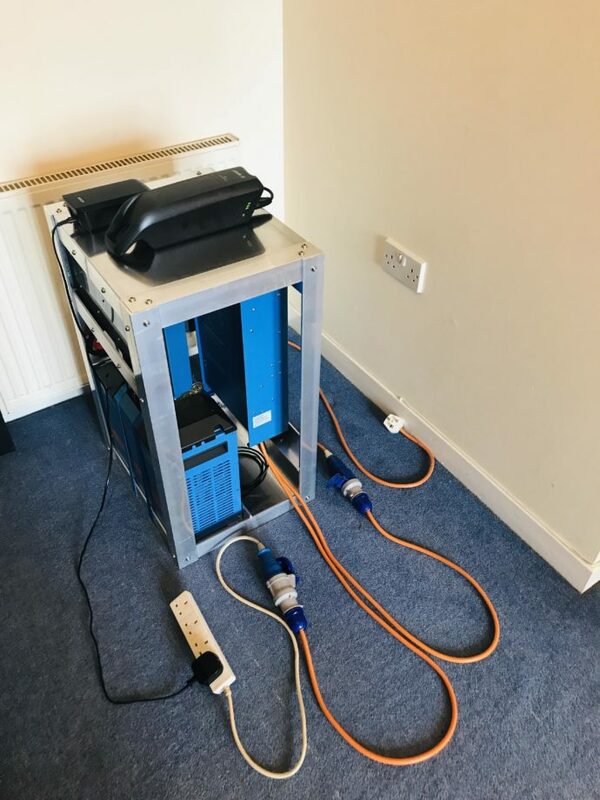 Using this system my standard leisure battery is always full off-grid, either charged from my Powerpack or solar, plus there’s increased energy and power available for the needs mentioned earlier. Pretty lights and LED momentary start switch. USB GPS to set a Geofence when parked. 16A Commando plug/socket connections top right, allows simple inline connection from the back of the shore hookup and prior to the RCD/consumer unit. Having recently written about Victron’s new LiFePO4 SuperPack range along with a comparison to AGM, now seems a good time to compare lead vs different lithium types – so you can see why in this case weight, dimensions and energy density were more important than cycle life and better (higher) discharge C rates (power). Useable energy and cycle life are based on 80% depth of discharge for LiFePO4 and 50% for AGM, these being considered the most economic use of those battery types. The NMC lithium can be discharged to 100% in ‘Performance mode’ albeit at the cost of cycle life, giving more useable kWh than the 80% DOD shown in the datasheet and in the table above. 75% is considered the ‘Default mode’, 100% is ‘Performance mode’, all of which can be adjusted by your dealer with the Lynx Ion BMS tool. 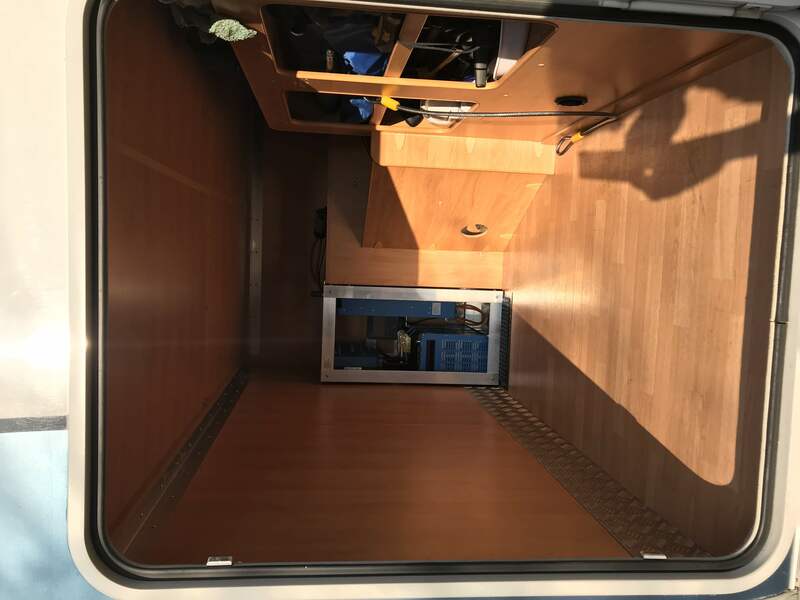 With no modifications to my standard motorhome system, other than the inline connection, this drop-in modular build has proved a great way to get more Ah. Lithium batteries are not essential though, subject to your needs, but in my case using NMC Lithiums as opposed to my preference for LiFePO4 was necessary – due to the required location of the pack and weight. Using a lead based system was out of the question as it would have loaded the back axle way too much and there would simply not have been the space to accommodate all that dead lead, let alone my eMTB. If you have any comments about my ‘Powerpack’ build I’d be pleased to hear from you in Disqus below. For technical questions please ask me or indeed others on the Victron Community site.